As part of the Design Service, which has been established successfully on the international market for years, ASK Chemicals is focusing intensively on the topic of simulating foundry processes. This involves using almost all well-known software solutions, such as Magma, Flow-3D, Arena-Flow® and Novacast. The company has thus gained a great deal of experience over several years, both in the area of simulating casting and solidification and in the area of simulating core shooting. The following article provides an overview of the potential that core shooting simulation offers. Not only does global competition demand ever-improving quality with shorter development and production times at lower costs from the companies; the constant upgrade of an increasingly diverse product range is the rule nowadays and presents a challenge to the caster that is at least just as great. 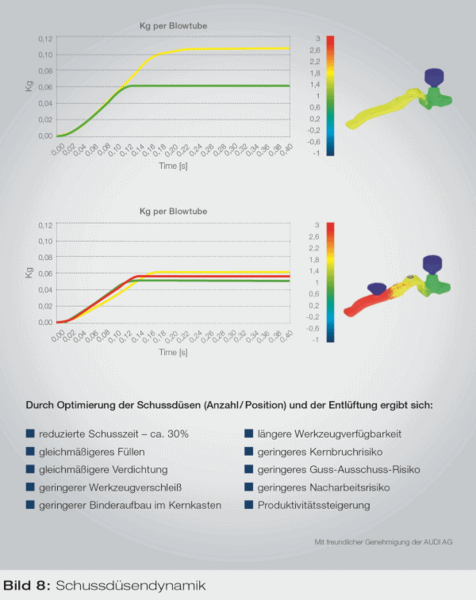 In this situation, computer programs, such as simulation software, can help lower costs, reduce development times and design optimized stable processes. This is not a new insight, as this practice has been mastered in the casting and solidification area for years. While the development process from the idea to production led in the past from the drawing board via model construction, test casting and various adjustments to the finished product, computer-aided design (CAD), simulation, computer-aided manufacturing (CAM) and prototyping are used today. In brief, we speak of computer-aided engineering (CAE). With regard to model construction and also, specifically, the development and design of casting systems, this has certainly been the case for some years now. 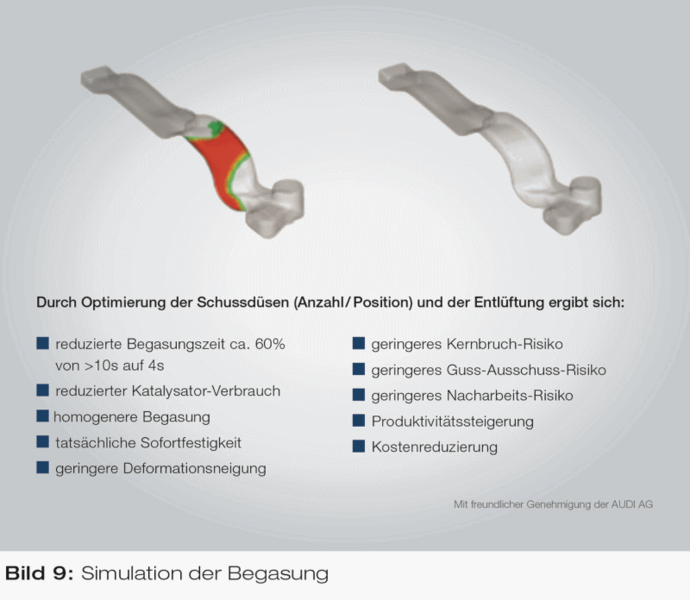 We are all familiar with the advantages and possibilities that simulation methods offer in this context. However, the simulation of core production must still be considered to be relatively new. But do we need this type of simulation? Surely, nobody knows more about their core business, i.e. their core production, than experienced casters themselves. Nevertheless, we must ask ourselves – is this true? Do we really know what happens and whether we have designed the most optimum setup? This example also clearly shows that the filling dynamics or the filling behavior depends primarily on the flow conditions of the air in a core box. This flow behavior can be illustrated by flow vectors and shows very clearly where insufficient compaction or problems with gassing can be expected. In Figure 5, areas with insufficient airflow are shown in dark blue. With regard to gassing a core, this type of evaluation by means of simulation provides an initial insight into whether the process is homogeneous. If the lower box area already displays poor flow conditions, it can be assumed with certainty that gassing problems will occur. In this case, this means that significantly longer gassing times and unnecessarily high amine consumption are accepted in practice as a “series production status” of production. We must therefore speak of inefficient use of the amine here. What are known as family core boxes are often designed to go with existing core shooting machines. Production is then frequently faced with the problem that the compaction of certain cores or areas of cores is insufficient, which often leads to increased cleaning effort or even considerable rework of the cast parts. In most cases, this is caused by the interaction between the geometry of the shooting head, which is installed, accepted as given and not considered further, and the actual setup of the core box and the arrangement of the shooting nozzles.